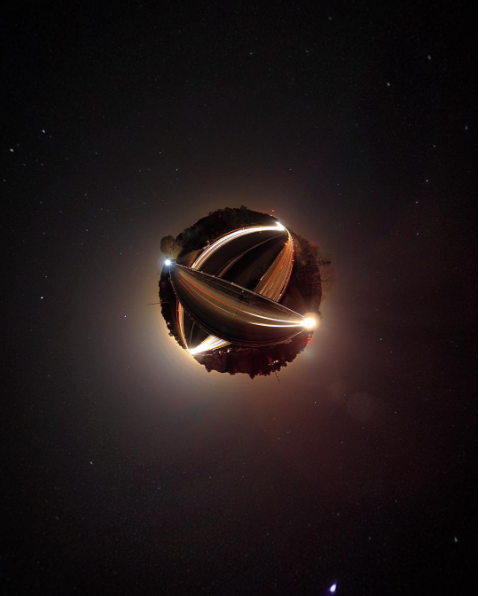 Mark Marano is a prolific photographer who has been taking 360-degree photos for more than a decade, and he has captured among the first, if not the first, little planet time lapse videos since 2010, before the advent of 360 cameras such as the Ricoh Theta in 2013. In this post, I asked Mark about his perspective on the longevity of 360 photography. He also provides advice for photographers who want to explore 360 photos and videos. 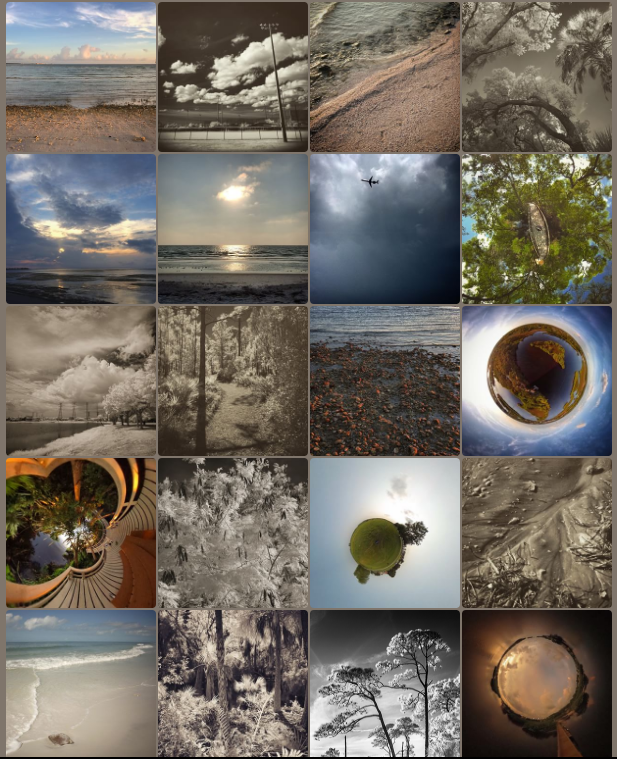 Mark Marano is a lens-based artist who works primarily in the mediums of still and time-lapse photography. Among many other creative and technical areas he dabbles in, he is also a writer, inventor, and website/application developer. He started learning and teaching himself film and digital photography in the late 90’s, and experimented with many techniques. He has exhibited and sold work in galleries and museums, and has also performed professional work for clients. Most of his work exists to explore and share perspectives of nature and life itself. One message in his work, sometimes subtle, relates to the journey of life and how by exploring new ways of seeing life, one can transform one’s life, the world, and reality itself. MT: How did you get into 360 photos and videos? MM: I first began experimenting with 360 degree photography in the early 2000’s when I designed and built a custom panorama head to perfectly stitch together panoramic images. 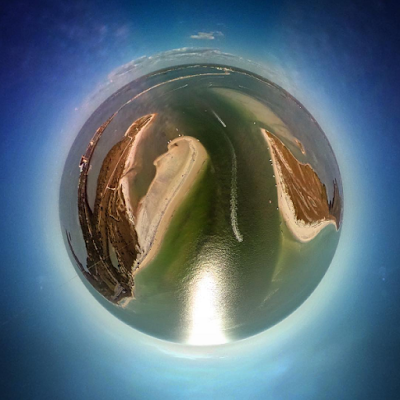 Several years later, when I first discovered the ‘little planet’ look in early 2009, I researched the most simple way to make these using a circular fisheye lens. After creating a few images, I thought how neat or awesome would it be to make time-lapses with the technique. As no one had ever done it before and at the time no technology existed to capture the [fully spherical] 360 x 180 degree equirectangular image in one shot, I began researching and developing a method to automate the process (as my proof of concept that March involved walking around in a circle for an hour with the camera on a monopod hoping the images would somewhat align). A few weeks later, after scrapping a method using two identical DSLR cameras with circular fisheye lenses (due to parallax errors), I engineered a custom mount to use on a motor that would rotate and automate the capture of all the shots on its own (while keeping the camera high enough above the tripod to minimize its size in the image). I shot a number of these in 2009 though the time-lapses were left incomplete due to issues in automatically stitching together all of the HDR images perfectly that I didn’t resolve (as I got caught up in other things I was facing in life). 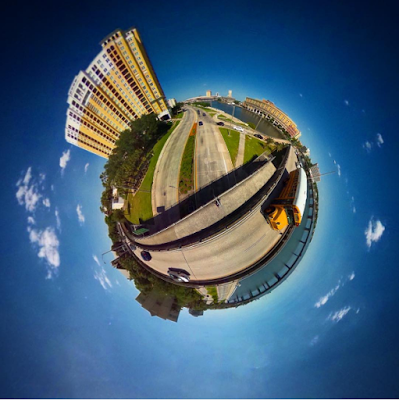 I finally shot and created the first successful little planet time-lapse in early 2010. I decided to not shoot it as an HDR in order to simplify the stitching process, though the process was still quite lengthy and took days to process on the computer. It worked and I had created a repeatable technique. Years later, I was glad when I got the first Ricoh Theta camera in 2014 and was able to very easily shoot aerial 360×180 degree images that May. The quality wasn’t anywhere near as good as my custom DSLR rig, though I was happy to experiment with a much simpler technique (even though it involved hiding out of view hoping the wifi connection wouldn’t drop and continuously pressing the trigger button in the app before the interval timer feature was later added to the camera). In August of 2015, I sold the motor and custom mount for the 360 degree rig as I had barely used it, and just a few days later the Theta S camera was announced, opening new doors of possibility. MT: Some photographers have dismissed 360 photos and videos as a fad. What do you think? MM: I understand how others can see 360 degree photography and videography as a fad, and how so many other photo techniques or looks can also be short-lived, especially in the recent years of the explosion of the internet and social media, though I still do see a place for it. We often find ourselves struck emotionally by the beauty and awe of something new, or can easily get caught up in the craze of needing to do something new or unique or wanting to be the first do something, though as we work through these feelings and learn to transcend them, we can focus on what truly matters, and begin to create more purposefully. In my own journey, I’ve seen countless times how many of the new techniques (that I thought were the one, the answer, all I’d need to shoot for a long time) quickly became old and mundane. Sometimes the new would become old as soon as I completed a single project or shot a few images with the technique. What we must learn to do, rather than continuing to chase after the latest and greatest, is to become more driven by our purpose and intent, and allow ourselves to flow and be guided intuitively. Sometimes that will involve new techniques, though often it will involve shifting internal perspectives without needing to acquire new gear or continuously expand external methodology. If a scene or image calls for 360 degree photography, then go for it, though don’t go shooting it as such just because you can or feel you must. Sometimes I think of quitting photography altogether because of this madness. In short, do what truly inspires you. While the 360 craze may slow down or come to end for many, I do see the technology itself being useful for a long time, especially when it’s used deliberately or for special purposes. I’ve never worn VR goggles, though have been to an IMAX Dome theatre once (many, many moons ago). How neat would it be to step into a room or theatre and be surrounded by a full 360 x 180 degree high resolution video of someplace you’ve never been to in nature or on the other side of the world, and to get a glimpse of life through someone else’s eyes as if you were really there/them? While this immersive experience may have limited uses, it’s just one of many other useful possibilities for 360 x 180 degree imaging. MT: Many experienced photographers have difficulty with composition for 360 photos and videos, or understanding how they can be used. As an experienced photographer yourself, do you have any suggestions for your peers about how to use 360 photos and videos? MM: I can imagine how embracing 360 degree photos and videos might be difficult or challenging at first. It really is about learning to see the world in new ways. For me, very shortly after I first began photography, I got quite interested in wider perspectives. I think my first lens (after the 50mm prime that came with the manual focus SLR film camera I bought) was an ultra-wide 20mm lens. Not too much later, I got a circular fisheye adapter lens. I always seemed to want to be able to step back and include more in the image. It could be helpful to do like I did and begin with an interchangeable lens camera and begin to widen back to a wide angle then ultra-wide and then fisheye lenses, or to start using a 360×180 camera to create 180 or 360 degree wide panoramas before also focusing on including everything around it in all directions. By slowing widening back to greater perspectives, it becomes easier to be able to include just a little bit more than you previously had. This is true not only in photography but also in life/spirit. Photography played a role in my own journey and growth in life. As we learn to perceive the world and life through higher or wider perspectives, it becomes natural and much more effortless to be able to see photographically and be inspired to create images in new ways. For instance, when I mounted the 360 degree cameras on a kite, quadcopter, very tall pole on a wheel, several feet high above a moving car, a few feet down in front near the ground of a moving car, created infrared little planet images, etc, etc before seeing any of these ever done before, the ideas just came to me. I was receptive and inspired by an idea, and then became engulfed in making it happen (either by naturally allowing it, or sometimes more often than not, getting caught in the challenge, research, and invention of figuring out how to execute it). As a part of my work is about continuously expanding perspectives and growth in life, new ways and metaphors to illustrate this naturally come to me. Learning to tune into and align with your purpose, whatever it may be, allows it to flow to and through you much more effectively. Sometimes we do get stuck in the creative process. In that case, either go out to nature or meditate or do something to quiet the mind to open yourself up for the ideas to come, or you can also look at what images others are making, and ask yourself how might you expand upon that idea (or if you’re new, study the technique and learn/practice what they did to create their image before you get a feel for your own vision). In composing a 360 degree image (still or moving), ask yourself what do you really want to convey or do with it and go from there. Begin to focus on just one aspect at a time.. if you’re wanting to make little planet images, then go explore or think of places that would look good in the little planet perspective. What’s directly below and near the camera is very important as it will be a significant part of the image. It’s not just about the sweeping landscape or panoramic view but more about the immediately surrounding area. The next most important aspect is the relationship of the placement of the camera to the surrounding elements of the image that will be around the circumference of the little planet. Experiment with how near or far you place the camera to the surrounding objects in the environment and you’ll quickly learn how it changes the look of the image. The height of the camera above the ground can make a huge difference in the look and feel of the image. Consider what would look interesting if you were looking straight down at it, especially if you’re mounting the camera high up, and place the camera in or near the center of that. I try to remember to look at the ground before finalizing the exact placement of the camera as it will be the biggest area of the image when the camera is near it. Start by keeping it simple. Focus on photos before videos. In videos, begin by having the camera still rather than moving it during the shot. If you’re moving it, begin with a simple movement before a complex one, or start with virtual movements in software. There is a world of possibility of what can be done when capturing everything around you. Just like slowing broadening your vantage-point of life and the world, add just one dimension or aspect at a time. It’s okay, you don’t need to do it all at once, and after you learn or master one aspect of the technique, it becomes much simpler to experiment and add another. If you’re feeling stuck, make a simple change. 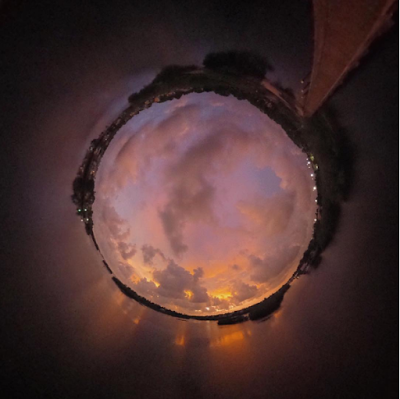 If you’re not liking your little planet images, turn them around into a stereographic projection ‘tunnel’ or ‘rabbit hole’, especially if there’s a lot going on across the whole sky. Another idea is to simply carry your 360 degree camera everywhere you go and experiment with it in your daily life to get a feel for what works and what doesn’t. Even if you don’t like the large majority of your images, if you get one or two that you like, that’s a starting point. If you want to use 360 degree images to capture memories or events in your life rather than photograph landscapes or create art, a simple idea to begin with would be to leave the camera running, capturing video, in the place of where someone would be standing or sitting during the event as if it were a participant or observer of the party or event. Keep the video in full equirectangular form and then you can later pan around everyone and re-live the experience in a new way. You could also do this by placing the camera in the middle of the table or a little higher up than everyone if in a larger space or with more people. 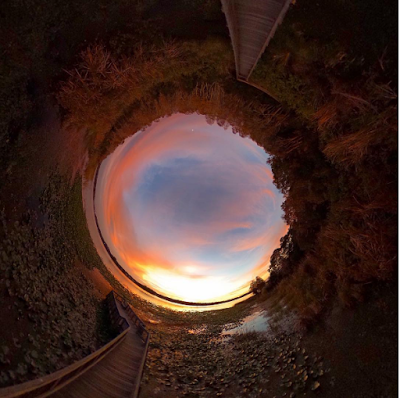 I personally haven’t really used 360 degrees to capture events like this (except for some panoramas I manually shot while hanging out with others over a decade ago), and usually do my best to hide outside of the 360×180 degree photo or video. I think walking around with a camera on a selfie stick in your hand would be most suitable if you’re on an adventure, vacation, or wanting to use it to vlog. Otherwise, I’d suggest finding other unique ways to mount the camera for new perspectives that were not previously possible with regular cameras. The placement and mounting of the camera (with the challenge of the mount itself not showing up when some cameras literally capture themselves) is the most critical aspect to learn and master for 360×180 degrees. I’ve found it fun to play around with how and where I can mount the camera. A long while back (before mounting the camera 13-18+ feet in the air on a pole on a wheel I walked around with), I thought it’d be neat to mount the camera to my bike high above it when I went for a ride (though didn’t find a good solution at the time to get the elevated view I desired, and I think I stopped looking as after biking with my first Theta camera mounted on a long pole (just to transport it and not shooting) I noticed the plastic tripod mount starting to break and I later lost that camera in the gulf due to the broken mount). Experiment and be creative with where you can place the camera during a normal activity to see what it looks like in a new way. Play, follow your heart’s desires. You’ll discover something that works for you. Sometimes the best tripod, rig, or mounting option can be found at your local home improvement store. While some of these unique mounting positions might be fun, I do realize they can also be short-lived, however they can provide some good perspectives when used in moderation, like when on vacation or an adventure. If putting together a compilation video of a trip or experience, the 360 degree shots can offer additional perspectives in between other normal shots. If nothing else, the view from the small camera could be cropped and processed as a rectilinear image or video simply for its vantage point. The simplicity of having captured everything automatically in all directions allows you to still participate in the activity/event and be able to focus and engage more fully in it. So many of us often miss out on the experience itself because we’re too focused on recording it. Seeing in all directions, 360 x 180 degree spherical cameras can help us be more present and live in the moment rather than think about capturing the moment. MT: Thank you very much, Mark. I’m sure many photographers will benefit from the advice you’ve shared. Thanks again! You can check out more examples of Mark’s work here. You can also follow him on Instagram.